The seemingly barren, grey-brown hills that line the northwest shore of Lake Mead conceal a variety of hidden, scenic landscapes, principally many outcrops of deep red Aztec sandstone, visible most spectacularly at Valley of Fire State Park. But they also contain old mines, interesting geology, ancient petroglyphs, Mojave desert flora and narrow slot canyons, of which the most easily reached is formed by Lovell Wash, a tributary of Callville Wash, as it cuts into a ridge in the Gale Hills at the south edge of the Muddy Mountains. 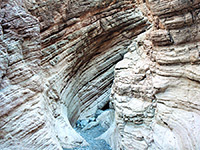 Lovell Wash is accessed by Northshore Road (NV 167) that crosses the north side of Lake Mead National Recreation Area, between Las Vegas and Overton Beach; a side road branches off to the north next to the Callville Wash crossing (at milepost 16), runs along the side of a grassy bank then descends into the wash. 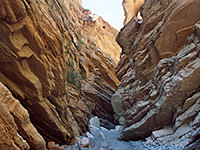 Regular cars can be parked at roadside just before the descent, though 4WD vehicles are able to continue most of the way to the mouth of the narrows (2 miles) since the hike to the canyon is along an old mining track, linking Callville Wash Road with Lowell Wash, meeting the latter 0.6 miles downstream of the slot section. However, access has become more complicated since early 2015; part of Lovell Wash just below the narrows crosses a private inholding, site of active mining operations, and the usual approach route is blocked with a fence and No Trespassing notice. The private area runs east and west across the foot of the Gale Hills, extending a little way up the steep slopes, so reaching the canyon while remaining entirely on the surrounding BLM land is very difficult, though an alternative approach up and down two shallow ravines half a mile east is thought to be acceptable. 9 views of Lovell Wash.
TopoQuest topographic map of Lovell Wash. The dirt road from Hwy 167 forks just after crossing the wide, stony streambed of Callville Wash; left (road 94a) is the old mining track to Lovell Wash while right (road 94) leads towards Bowl of Fire, another dramatic outcrop of Aztec sandstone. The left fork follows a minor drainage for a while, traverses a hillside (and exits the NRA), crosses the drainage again then continues climbing towards the edge of the mountains which rise up to the west. The remains of Anniversary Mine soon come into view - tailings piles, shafts and crumbling concrete structures, all dating from the 1920s when the mine was a major source of colemanite, a borate mineral. The place is now a good site for hunting semi-precious stones such as agate and travertine. 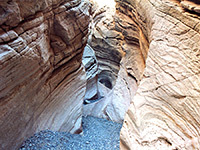 The track proceeds past the spoil heaps and descends to Lovell Wash just as it starts to become enclosed, by stony hills formed of twisted and eroded rock of many muted colors. 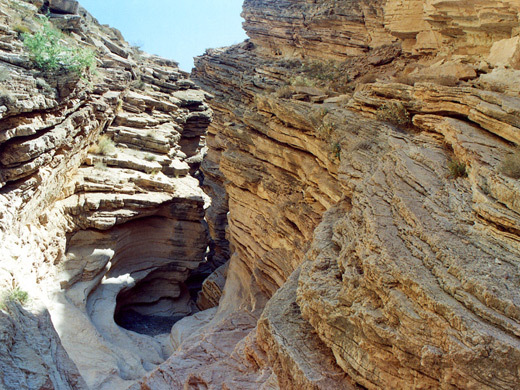 The wash crosses several outcrops of the upturned strata, some angled at nearly 90°, including one quite narrow section between two more sets of mine relics, before a temporarily wide, flat stretch leading to the start of the slot. The narrow section is the location for the new fence across the wash, blocking access at this point. The alternative route is northwards along the minor drainage encountered earlier, leaving the road 0.6 miles from the edge of Callville Wash; along the streamway for 0.67 miles to a fork, up the west branch for 0.4 miles to a saddle, at the east edge of the mining area, then down a little drainage on the far side, reaching Lowell Wash in another 0.55 miles. The entrance to the slot is just upstream. 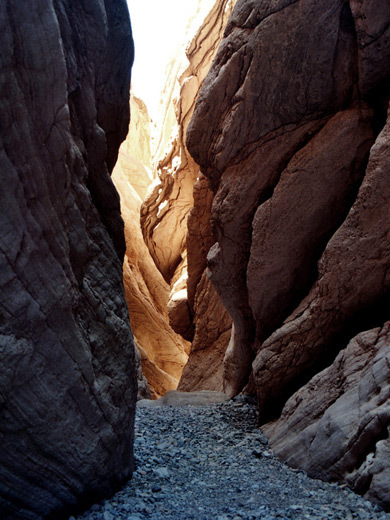 All the narrow part of Lovell Wash is through the angled limestone, so the slot canyon consists of successive V-shaped channels across the different layers, without any obstructions apart from a few small drops and some shallow crevices that hold water for a time after rainfall. The canyon is quite deep though never especially narrow and does not have any overhanging rocks above, hence it remains well lit. The limestone is white to cream in color with occasional pink and orange tints, and at floor-level the rocks are water-polished and just a little slippery. It only takes 15 minutes to walk along this enclosed section, after which the wash emerges into the open again and is flat and shallow; there are no more narrows further upstream. The canyon seems to get a fair amount of visitors, judging by the number of footprints.